The world’s fastest train journey starts, rather appropriately, at the futuristic-looking Beijing South Railway Station, which looks like a recently landed UFO, especially at night when the building glows blue. 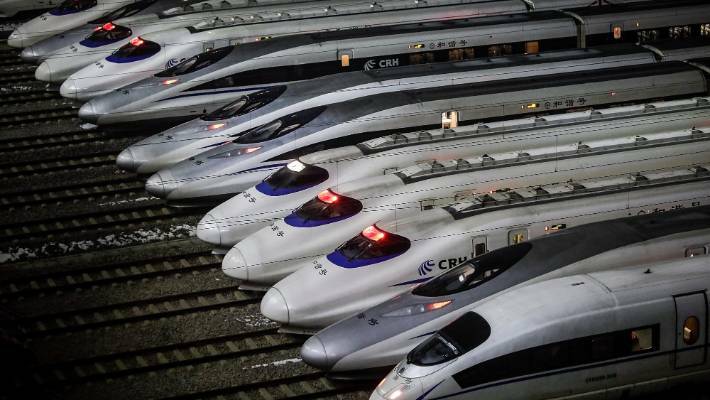 Settle yourself in without any further ado because, within seven minutes of departure, your train reaches 300km/h – an electronic screen at the front of each carriage indicates speed – and Beijing is gone in a blur. 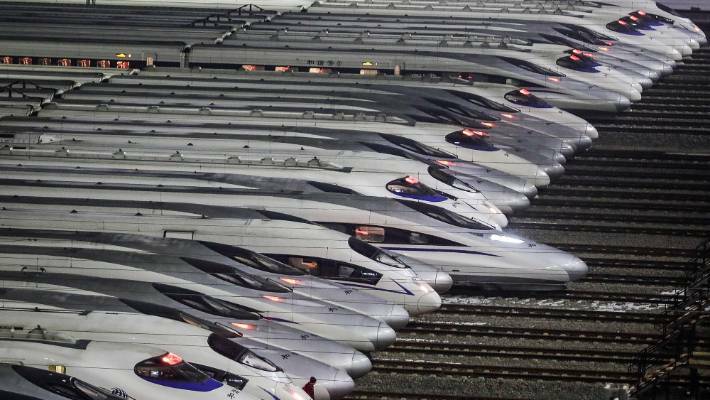 China’s high-speed trains have reached 487km/h in trials, but 350km/h is the maximum speed on commercial routes. 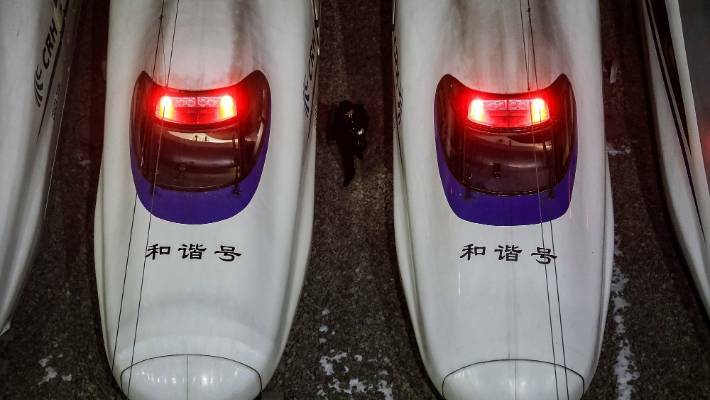 The fastest trains only stop once at Nanjing South and take four hours, 48 minutes to reach Shanghai’s western suburbs some 1300 kilometres away. Other trains make more frequent stops (six or seven), adding 30 minutes to travel time. There are actually 24 stations on the high-speed line, but some are only served by slower trains, which nevertheless zip along at an impressive 250km/h. It’s tempting to make the whole journey in one go just so you can say you’ve done it, and some stops are more commonly relevant to travelling sales- and business-people than tourists. The fastest trains only stop once at Nanjing South and take four hours, 48 minutes to reach Shanghai’s western suburbs some 1300 kilometres away. Still, there are some cities where you ought to consider disembarking. The first, Tianjin, arrives before you’ve even had time to relax – it’s only 146 kilometres down the track. The big financial and educational centre has quite a history as an old port on the confluence of the ocean, rivers and Grand Canal, an extraordinary engineering project that linked imperial China from north to south. 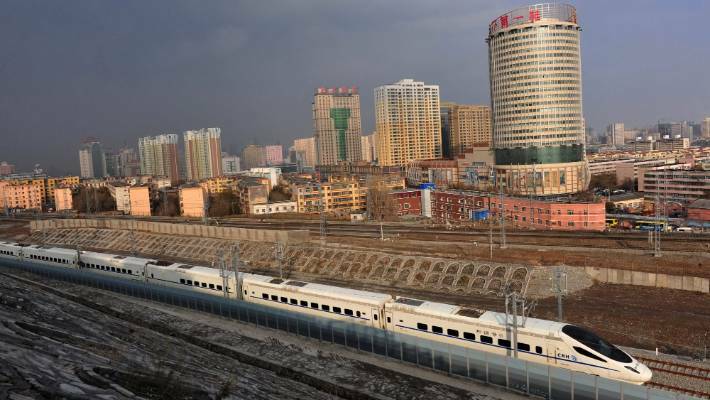 A CRH high-speed train runs across Urumqi city. Another quick whoosh along the high-speed line brings you to the capital of Shandong Province, Jinan. It has a few pockets of old tranquillity which, as in many cities in China, are being overshadowed by mushrooming high rises. Your reason to stop off here is Jinan Museum’s fine collection of ceramics and calligraphy, and for the vast Provincial Museum, which has stunning pottery 3000 years old – though, unfortunately, it lies right across the other side of the city from the high-speed train station. 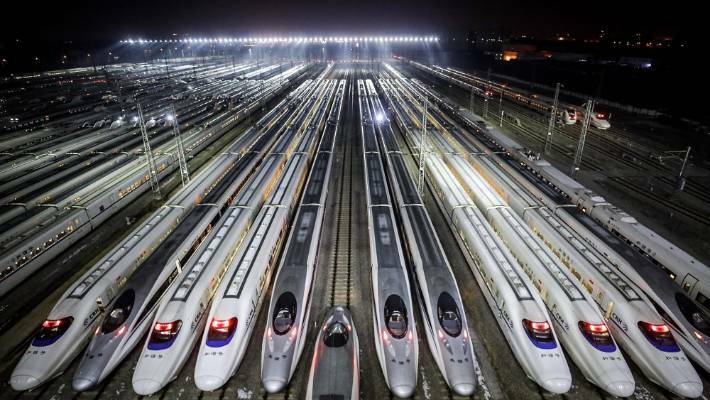 For the next 650 kilometres or so the train might stop at various stations in cities that are part of China’s most important economic zone. Sit back and enjoy the views. The track is raised on pylons, providing a great outlook first over the cornfields and farms of northern China, then over the rice paddies of the more humid south. The trains are sleek white with a pronounced bottlenose. Carriage interiors seem more airplane than train. If you’re hungry, head to the dining car, take your pick of pre-packed meals wheeled along the corridor on trolleys, or break out your picnic and use the on-board microwaves. Complimentary meals and drinks come to those riding in first and business class. ﻿The absence of a regular train’s clickety-clack is striking. In fact, the high-speed train barely makes any noise at all, somewhere below 70 decibels, the volume of a normal conversation. What’s more, you’ll barely feel any vibrations during the journey, though you might notice concentric rings shivering in the cup of green tea brought to you by an attendant. Eventually the train glides into Nanjing South some 300 kilometres north-west of Shanghai, which is the only stop on the fastest service. Nanjing is the “southern capital” in contrast to Beijing, the “northern capital”. It was the capital of China during the Ming Dynasty (1368-1644) but little survives from this time, apart from the venerable drum tower, a pavilion nearby housing a giant bronze bell and the ruins of an imperial palace. Quite a bit of the old defensive wall still runs through the city centre, however. 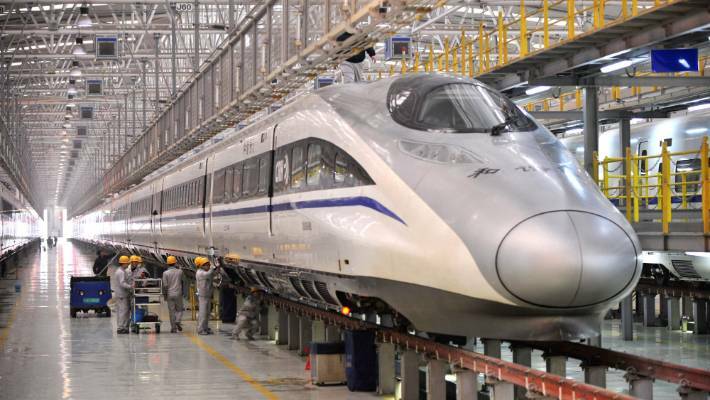 Mechanics check a high-speed train at Xi’an Electric Multiple Unit Maintenance Base in Xi An, China. Nanjing was again the capital of China during its republican era (1911-1937), and a number of rather elegant buildings from that period grace its downtown. In truth though, Nanjing is not so much about sights as about character. This is a lively university city with a relaxed air, cultured population, good museums and leafy boulevards lined with cafes. ﻿It’s also dotted with riverside promenades, lakes and forested hills which make for a pleasant antidote to the notorious summer heat. Purple Gold Mountain east of the city is a favoured retreat for locals. Here you’ll find the rather splendid, blue-roofed mausoleum of Sun Yat-sen, the revered founder of modern China, beautifully set into the hillside in gleaming marble. You’re now near Shanghai, and the train won’t hit its top speeds for the remainder of the journey. Some services make one of two more stops. One is Wuxi, which in the past was a prominent trading town on the Grand Canal that ran all the way north to Beijing. It has a fine setting on often-misty Lake Tai, from which the Chinese gather the magnificently weathered rocks that feature in traditional gardens. The livery is soothing grey, the seats navy blue in second class, stylish red in first. Better, really, to save your time for a final stop at nearby canal city Suzhou. Many visit Suzhou on a day trip from Shanghai, but it’s worth an overnight or two. It’s one of China’s more charming small cities, with an animated central shopping district. During the Ming Dynasty (1368-1644) Suzhou was one of the world’s wealthiest cities, lauded by Marco Polo when he visited for its canals and lakes, silk factories, artisans and leisurely lifestyle. ﻿You can inspect ceramics, jade, textiles and statues from its centuries as a scholarly and artistic centre at the excellent Museum of Shanghai, which inhabits a striking building by architect I. M. Pei. These days Suzhou’s past glories are particularly symbolised by its classical gardens, several on the UNESCO World Heritage list. The smallest of all the gardens, the Master of the Nets, might well be the most exquisite. It was first laid out in 1140 and is ingeniously designed to appear much larger than it actually is, thanks to a series of courtyards through which windows in enclosing walls frame pockets of garden. In every way, these classical gardens are quite the contrast to an ultra-modern train line, yet just another part of the ingenuity of this vast and historic nation. The writer travelled to China at his own expense.